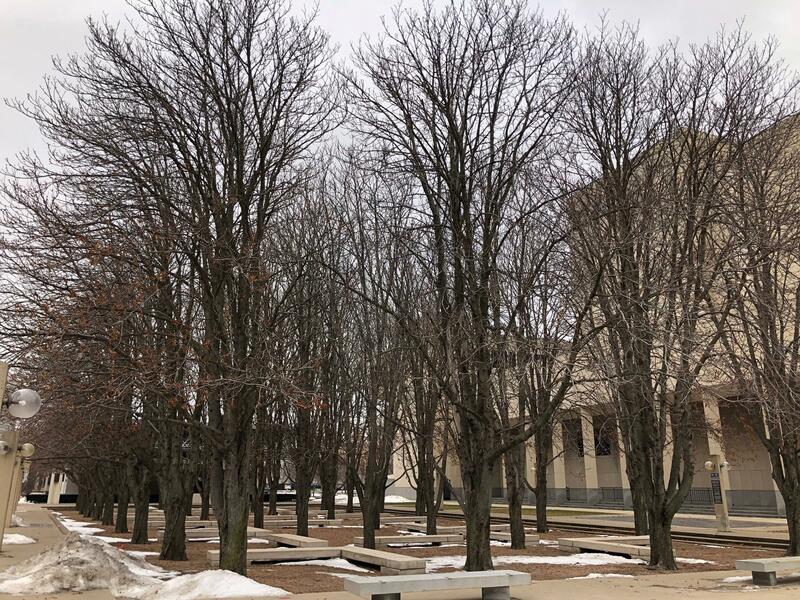 The chestnut grove on the Marcus Center grounds is a core element of the landscape designed by Dan Kiley. Marcus Center, Inc. says it wants to make the building and its grounds more open and welcoming. WUWM's Environmental Reporter Susan Bence reports. Milwaukee’s Historic Preservation Commission voted Monday to consider the Marcus Center for the Performing Arts and its grounds for historic designation. Designed more than a half century ago, the facility fills a large city block along the eastern edge of the Milwaukee River between Kilbourn and State Streets. In 2017 the Marcus Center signed a 99-year lease with Milwaukee County to manage the performing arts complex. It announced plans early this year to update the building and its grounds to create a more open and welcoming facility. Local landscape architect Jennifer Current is one of the people proposing its historic designation. She says the center’s landscape is a treasure. It was designed by renowned landscape architect Dan Kiley. "He was a visionary of the modernist movement,” Current says. “I suddenly saw that lines, alleys, orchards, trees, and cropped hedges, canals, pools and fountains could be tools to build landscapes and infinity, just like a walk in the woods." The heart of the Kiley design is the chestnut grove. Current considers it a welcoming enclosure without walls. “It’s concrete, it’s gravel, it's trees. These are simple materials used in elegant ways that are accessible to the public,” Current says. The Marcus Center plans to replace the trees with grass. The plan also calls for making the building more translucent. The grounds show signs of wear and tear. Architect Jim Shields is working on the re-visioning. He told the Historic Preservation Commission that both the building and Kiley’s landscape have been significantly modified over the years. He came with images to prove it. 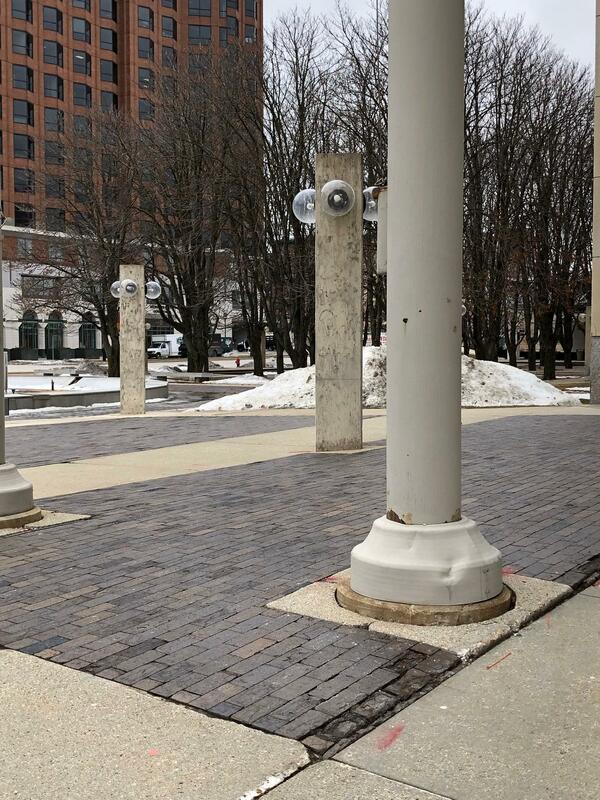 “The bottom slide shows that in 1989 hundreds of linear feet of concrete benches were added – not designed by Kiley or by [architect Harry] Weese,” Shields said. “The biggest for me, 20 years into the life of the Weese building, it was found that the 1-inch travertine marble was cracking off and the connections were failing." The failing marble was replaced with Minnesota limestone. Commission member Alderman Bob Bauman said although the panel will begin the process to consider historic designation, that didn't mean an automatic end to the Marcus Center plans. “Whatever the merits of the plans are, are not before us today. We’re simply talking whether or not a particular property or site is eligible for permanent designation,” Bauman said. The commission has six months to complete its evaluation. Marcus Center CEO Paul Mathews warned the commission that the move conflicts with the timeline for revamping the property. It could result in no free programs next summer.